You will need an 8” (20cm) Pie dish. 500gm block of butter puff pastry.  Place the oil and butter in a pan and add the leek, gently sweat for 5 minutes but do not brown.  Add the mushrooms and thyme, cook for a minute.  Stir in the flour and gently cook for a minute.  Slowly add the milk until you have a nice thick sauce, add the turkey meat and cook for a couple of minutes. 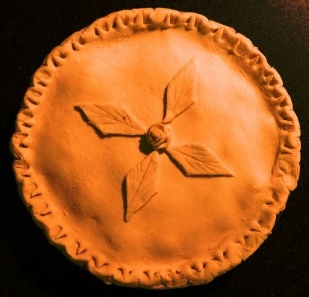  Roll out the pastry and cover the pie, sealing well and fluting the edges.  Brush with beaten egg and cook for 30 minutes or until the pastry is well risen and golden brown. N.B. If you are making the pie to freeze, do NOT add the turkey meat until the leek and mushroom sauce is completely cold. Use fresh puff pastry if you are freezing, not frozen!